Today I interview Elizabeth Dulemba. 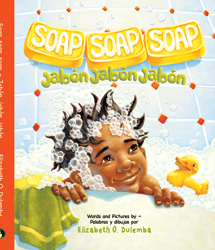 She is on a blog book tour to launch her new book: Soap, Soap, Soap ~ Jabon, Jabon, Jabon. Elizabeth and I know each other because we are both members of the Society of Children’s Book Writers and Illustrators in the Southern Breeze region (Alabama, Georgia, and Mississippi). 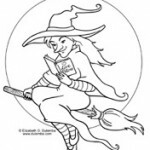 When we finish visiting here, you’ll want to visit her website to view the book’s trailer and check out the fun coloring pages and interior images. Your first book as an author/illustrator also happens to be a bilingual book in English and Spanish. How did that affect your writing process? Was anything different about the illustration process? 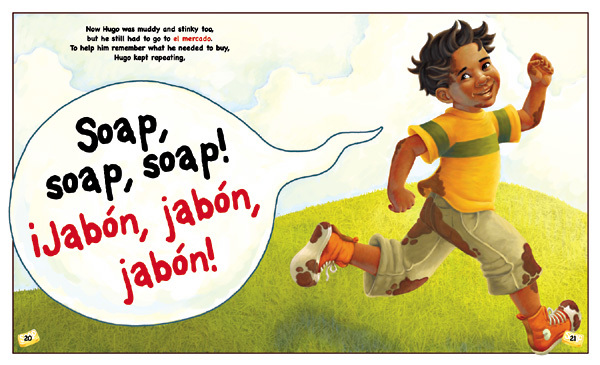 SOAP, SOAP, SOAP is based on a classic Appalachian Jack Tale, but I wanted to make it modern and relevant to today’s audience, and make the embedded Spanish easy to understand throughout the context of the story. It’s a bit like a puzzle, like any writing, just with different rules. For instance, you don’t want the Spanish term and its English translation to be too far apart. Like in the opening line: “…his mamá…handed him some money. ‘Here’s some dinero…'” That sort of thing. If the words are too far apart, the connection is lost. But I love puzzles, so it’s a fun way to write. As far as illustrating SOAP. The story came first on this one, so it was almost like any other project, although I had the freedom to tweak and rearrange the text as needed without offending anybody! I know you learned some Spanish for your book Paco and the Giant Chile Pepper. Were you able to translate your own book? I took two years of very intense Spanish lessons at the Latin American Association in Atlanta (and highly recommend them). I’m not fluent, but I did learn enough to be able to do the initial bilingual text myself. Of course, it had to be vetted by a professional translation company to make sure it was accurate. There are many things we say in English or ways we say them that simply don’t translate – and visa versa. I was close, but we had to make a few changes. I know from reading your blog that you embrace technology. What kinds of high tech skills are you working on now? Funny you should ask. I’m having lunch with an iPhone App creator tomorrow. I want to experiment with turning one of my book dummies into an iPhone story app – hopefully in time for Halloween since it has a witchy theme. Cross your fingers! I am interested in the moment of creation. Do you remember? Did it come from your writing place or your drawing place? Are those distinct places? My publisher for Paco and the Giant Chile Plant was so pleased with my work (I was the illustrator only) on that book, they asked me for more. I adore folklore, and Paco was a retelling of “Jack and the Beanstalk,” so the seeds were already planted to do another Jack Tale. I did research and read tons (which I’d done at other times in my life since my exit show in college was about the National Storytelling Festival in Jonesborough, Tennessee, where I heard Jack Tales from the master himself, Ray Hicks). And I didn’t have to go far for that research. The original SOAP story was in my own library in a volume of Jack Tales collected by Richard Chase and dedicated to me by my grandparents in 1975. Truly, I have an interesting history with these tales, they keep turning up in my life. Of course, the original is politically incorrect and completely unsuitable for modern times – that’s where the work came in – and while it is recognizable to those familiar with the story, it really ended up being something completely unique. Interesting factoid: the protagonist, Hugo, is named for my little cousin “Hugh” – a.k.a. the “Hughlito” in the dedication. I’m currently illustrating “The 12 Days of Christmas in Georgia” written by my friend Susan R. Spain for Sterling Publishing (Holiday 2010). I’m also writing a new novel, have a picture book proposal with my agent, and am speaking at four book festivals this Fall. I stay pretty darned busy. What do you do when you are not creating children’s books? Um. What? When I’m not creating picture books? Ha! Truly, this is my passion. I’ve wanted to create children’s books my entire life. This career demands a lot of tangents, like public speaking, volunteering as Illustrator Coordinator with Southern Breeze region of SCBWI and being on the Board for the Georgia Center for the Book, marketing, etc. but it all ties in with my children’s books in some way. I’m living my dream. But for completely unrelated activities, does going out to a nice dinner with my hubbie (where I talk about books), or digging in my garden count? Thanks so much for hosting me Sarah! For several years, Elizabeth has been the Illustrator Coordinator for Southern Breeze. The gallery exhibit of original art by Southern Breeze illustrators was her brainchild. After its inaugural showing at the Little Shop of Stories in Decatur, Ga. in May 2008, it was picked up by the Southern Arts Federation as a touring exhibit called Storybook Look. It made its touring debut at the Saenger Theater in Hattiesburg during the 2009 Fay B. Kaigler Children’s Book Festival.